The pumpkin patch, recently a soothing sea of green, is now a mess of dried out leaves and expired plants. Most varieties were all but obliterated by the last month’s heat and lack of water—no rain, no spare irrigation. Still, they’ve all done quite well. It’s always fun to have fat orange and pale green-white pumpkins assembled on the grass in the field in the fall. So far, I haven’t had much other use for them, most are too bulky and low-priced to haul to market (we load in a pick-up truck, a trailer is the next step), or fit into off-farm CSA shares. 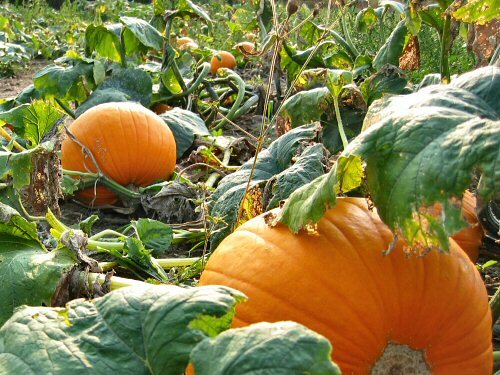 This year, maybe a one-day “organic pumpkin” mini-sale on the farm stand… And there are some small pie and seed pumpkins (Small Sugar, Snack Jack), more portable at 3-5 pounds (1.4-2.3kg). Here, a row of larger Neon, looking nice! Fantastic pumpkins. I really love the fall harvest season. Have you thought about doing a pick-your-own weekend or some kind of shareholder harvest festival to unload them?